Around five million baby strollers manufactured by Graco have been recalled because there is a risk the strollers will amputate a user’s fingers. The recall affects 11 different models of Graco strollers that were made between August 2000 and September of 2014. A Boston defective product lawyer knows when products are recalled, those who sell and own the defective items frequently do not receive proper notification. As a result, the dangerous product could remain in homes and on store shelves. Here, this means stroller owners could continue to be put at risk of serious injuries for a long time to come. According to ABC News, Graco has received reports of 11 finger injuries resulting from use of its infant strollers. These reports include six incidents in which Graco stroller users required fingertip amputation, as well as four reports in which partial amputation was necessary. The remaining incident involved a finger laceration. Around 4.7 millions strollers in the U.S. are affected by the recall. In addition, there are more than 200,000 potentially dangerous strollers in Canada and 10,300 in Mexico. Owners are being alerted to contact Graco immediately in order to be sent a free repair kit. 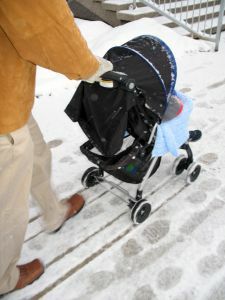 Until the stroller is repaired, owners are warned to use “extreme care” when they are folding and unfolding the stroller. Parents who wish to continue using the stroller can do so safely if they ensure they engage the lock properly. The repair kit will include new hinge covers, which should solve the problem. Hopefully, news of the recall will reach stroller owners and those who sell the stroller and adequate steps will be taken to prevent further amputations. However, there is plenty of reason to believe this will not occur. A 20/20 investigation found the majority of recalled products are neither fixed nor returned to manufacturers but instead remain in use or for sale. Estimates indicate only around 20 percent of recalled products are ever accounted for, even in a best case scenario. In some situations, the rate of people who turn in or repair recalled products is as low as 5 percent. Part of the problem is there are no laws at the federal level regarding what manufacturers must do when it turns out that they must recall a product. Manufacturers typically will make the choice to voluntarily remove defective products from the shelves, in part to avoid the risk of lawsuits. However, the current federal law does not impose minimum requirements regarding the amount of money a manufacturer has to spend to alert the public to risks. Federal law also does not specify what steps have to be taken or what minimum effort a manufacturer must put forth to initiate repairs or ensure all owners of defective products are alerted. It is illegal to sell a defective product, but resellers may not be aware the strollers or other items on their shelves are dangerous, and thus consumers may continue to buy things like strollers that amputate people’s fingers. It’s worth noting a recall does not absolve a retailer or manufacturer from liability for dangerous, defective products.